If you don’t solder the RCA or phone jacks onto the HiFiBerry PCB, you can use small RCA jacks mounted on the top of an existing plastic Raspberry Pi case. Just drill two holes into the case, mount the RCA connectors, and connect them by short wires to the L/GND/R connector on the Raspberry Pi board. Note, that in our example, there are no video-out, line-out and USB connectors on the board. But this will also work with a fully populated board. We just used one of our test boards where some connectors had been removed before. However I have a slightly different need and wonder if you would consider building a version with SPDIF coax input? Either as a separate board or combined with the analogue stereo input. We’re working on an S/PDIF output board. Can you tell me more about your use case for an analog and digital input? 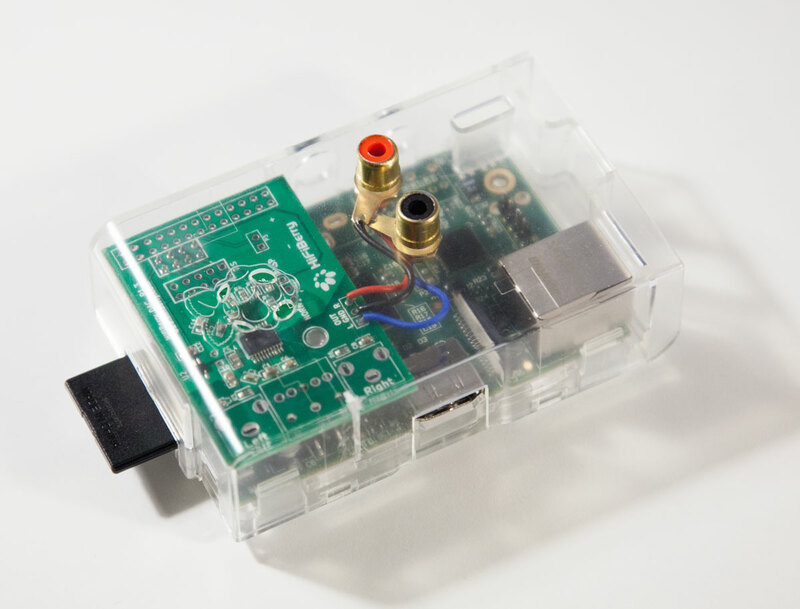 I want to use the Raspberry Pi as a digital audio recorder, with input being the SPDIF coax output from the church sound board. Would rather not convert the audio back to analog. A combined board might reduce the number of products a builder would have to support. A SPDIF coax to USB adapter would also work, but I have not been able to find one currently in production. Probably also will want to stream audio to the Web, while recording, in the future. Note: I am also experimenting with a UDOO board. Our HiFiBerry Digi is designed as an output only yet, but we might have the chance to connect an coax input. However, the space on the board is limited, therefore the connector might not be on the board. Would this be an option for you? Yes, because a case will be required for my application. Not sure if it will work with the Digi board as it is higher than the DAC seen here. We’ll check this, when it is ready. How did you connect the RCA connectors in the case? Is the GND cable connected to one connector only? Or to both? And which quality short cable is necessary to keep sound clean? The ground cable has to be soldered to both RCA connectors. If you keep it short you don’t need any special cables. I couldn’t see any negative aspects with my setup (unshielded cables). If you use longer cables, I would recommend shielded cables. I found a very neat and compact solution. I unsoldered and removed the RCA video socket from the Pi. I used a compact Perspex case like this http://www.ebay.co.uk/itm/281131322453?var=580207502730&ssPageName=STRK:MEWAX:IT&_trksid=p3984.m1423.l2649 and fitted a 3.5mm phono socket in the hole opening that was made for the RCA socket. Wired this to the HiFiBerry with short 5cm 3 ribbon cable using common ground. This way the audio connection comes out the side rather than from the top. Works perfectly. Hope this helps. Can you send us a picture? This would be interesting to other users. i used 0.25mm2 wires. However, for a short connection like this, it doesn’t really matter. Just use, what you have available. Could you provide me with the part numbers you used for the rca jacks please. I got my case Farnell already so I was thinking to try the same setup.